Cosmic rays are invisible, highly energetic particles of matter reaching Earth from all directions in space. Physicists divide cosmic rays into two categories: primary and secondary. Primary cosmic rays originate far outside Earth's atmosphere. Secondary cosmic rays are particles produced within Earth's atmosphere as a result of collisions between primary cosmic rays and molecules in the atmosphere. The existence of cosmic radiation (energy in the form of waves or particles) was first discovered in 1912 by Austrian-American physicist Victor Hess during a hot-air balloon flight. Hess was trying to measure the background radiation that seemed to come from everywhere on the ground. The higher he went in the balloon, however, the more radiation he found. Hess concluded that there was radiation coming into our atmosphere from outer space. 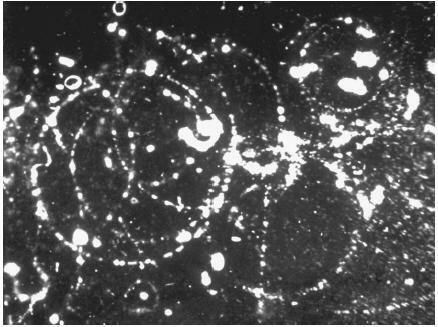 Although American physicist Robert A. Millikan named these energy particles "cosmic rays" in 1925, he did not known what they were made of. In the decades since, physicists have learned much about cosmic rays, but their origin remains a mystery. An atom of a particular element consists of a nucleus surrounded by a cloud of electrons, which are negatively charged particles. The nucleus is made up of protons, which have a positive charge, and neutrons, which have no charge. These particles can be broken down further into smaller elements, which are called subatomic particles. Cosmic rays consist of nuclei and various subatomic particles. Most cosmic rays are protons that are the nuclei of hydrogen atoms. The nuclei of helium atoms, made up of a proton and a neutron, are the next common elements in cosmic rays. Together, hydrogen and helium nuclei make up about 99 percent of the primary cosmic radiation. Electron: A negatively charged particle, ordinarily occurring as part of an atom. Electron volt (eV): The unit used to measure the energy of cosmic rays. Neutron: Particle in the nucleus of an atom that possesses no charge. Nucleus: The central mass of an atom, composed of neutrons and protons. Photon: Smallest individual unit of electromagnetic radiation. Primary cosmic ray: Cosmic ray originating outside Earth's atmosphere. Proton: Positively charged particle composing part of the nucleus of an atom. Primary cosmic rays are mostly made up of single protons. Secondary cosmic ray: Cosmic ray originating within Earth's atmosphere as a result of a collision between a primary cosmic ray and some other particle or molecule. Shower: Also air shower or cascade shower; a chain reaction of collisions between cosmic rays and other particles, producing more cosmic rays. Primary cosmic rays enter Earth's atmosphere at a rate of 90 percent the speed of light, or about 167,654 miles (269,755 kilometers) per second. They then collide with gas molecules present in the atmosphere. These collisions result in the production of secondary cosmic rays of photons, neutrons, electrons, and other subatomic particles. These particles in turn collide with other particles, producing still more secondary radiation. When this cascade of collisions and particle production is quite extensive, it is known as a shower, air shower, or cascade shower. Secondary cosmic rays shower down to Earth's surface and even penetrate it. Primary cosmic rays typically have energies that measure in the billions of electron volts (abbreviated eV). Energy is lost in collisions with other particles, so secondary cosmic rays are typically less energetic than primary ones. As the energies of the particles decrease, so do the showers of particles through the atmosphere. The ultimate origin of cosmic radiation is still not completely understood. Some of the radiation is believed to have been produced in the big bang at the origin of the universe. Low-energy cosmic rays are produced by the Sun, particularly during solar disturbances such as solar flares. Exploding stars, called supernovas, are also believed to be a source of cosmic rays. about the photograph which is the track of the cosmic ray? What is the difference between the strait track and the curved ones (nearly perfetc circles)?